And they were helped against them, so that the Hagarites, and those with them, were given into their power. For they sent up prayers to God in the fight, and he gave ear to them, because they put their faith in him. 1Ch 5:1 And the sons of Reuben, the oldest son of Israel, for he was the oldest son, but, because he made his father’s bride-bed unclean, his birthright was given to the sons of Joseph, the son of Israel; but he is not to be given the place of the oldest. 1Ch 5:18 There were forty-four thousand, seven hundred and sixty of the sons of Reuben and of the Gadites and of the half-tribe of Manasseh, all strong men, expert in the use of the body-cover, the sword, and the bow, and in the art of war, all able to take up arms. 1Ch 5:20 And they were helped against them, so that the Hagarites, and those with them, were given into their power. 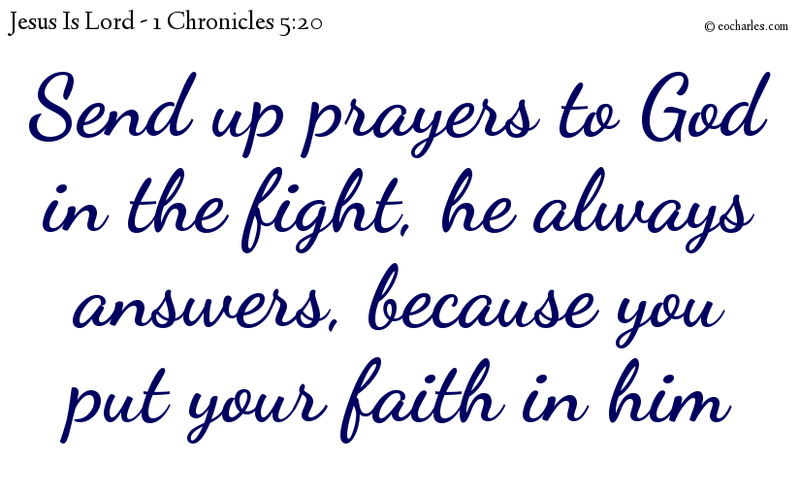 For they sent up prayers to God in the fight, and he gave ear to them, because they put their faith in him. 1Ch 5:22 And a very great number went to their death, because the war was God’s purpose. And they went on living in their place till they were taken away as prisoners. 1Ch 5:25 And they did evil against the God of their fathers, worshipping the gods of the people of the land, whom God had put to destruction before them. 1Ch 5:26 And the God of Israel put an impulse into the heart of Pul, king of Assyria, and of Tiglath-pileser, king of Assyria, who took them away as prisoners, all the Reubenites and the Gadites and the half-tribe of Manasseh, to Halah and Habor and Hara and to the river of Gozan, to this day.